First of all, I'd like to apologize. You should have been able to see this post Wednesday morning. Thing is that I was so sick of food that it's taken me this long to write this post. Not anything against this restaurant. I actually loved the place. The problem was that I had consumed way too much in the days before I arrived there. And now I really appreciate the starving model jokes. Kind of. Jade asked me how much weight I had gained from all my dining. The truth is that I have probably lost weight since I arrived in New York. There was all that walking. And truth be told, I never ate the entire entree. My stomach just is not capable of it. But as I said before, I love tasting new things so I paced myself accordingly. 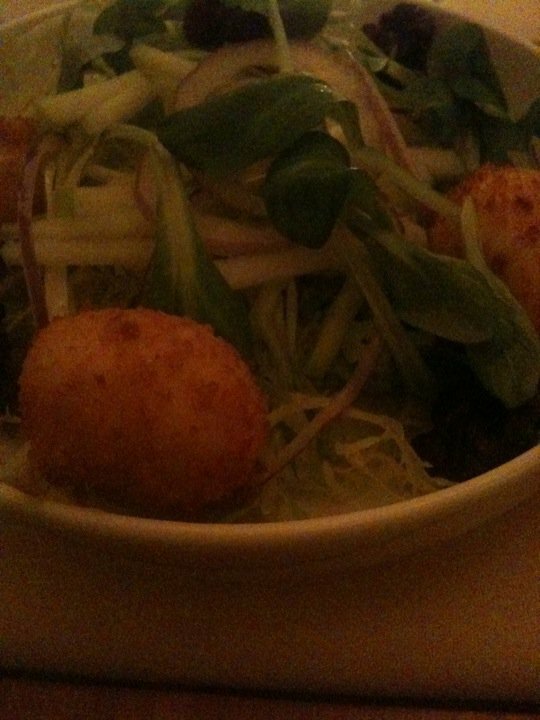 I continued my dining Monday night at Aquavit. This was one of the other places at which I was excited to dine. The first shock was when they asked me about preferences and food allergies. Really? I should have mentioned my displeasure with pistachios. But I figured that they would look pretty in a photo and I could pick around them. The next part of the experience was the selection of breads. I chose the sourdough and some sort of rye. Now I'm not a huge bread person but that rye was addictive. Heck. I might just return for that bread. And then they had the audacity to offer an amuse bouche. If I remember correctly, it was salmon with creme fraiche. I alao heeded Fluffycat's admonition. And so I went for the salad for my starter instead of the tartare. And what a wonderful salad it was. But I usually avoid salads as they are something I can do at home and so feel cheated in ordering them. But I don't think I'd make the smoked goat cheese croquettes. Next up was the pork belly. If I remember correctly (Yes, I know I could look at the menu online but I'm lazy. 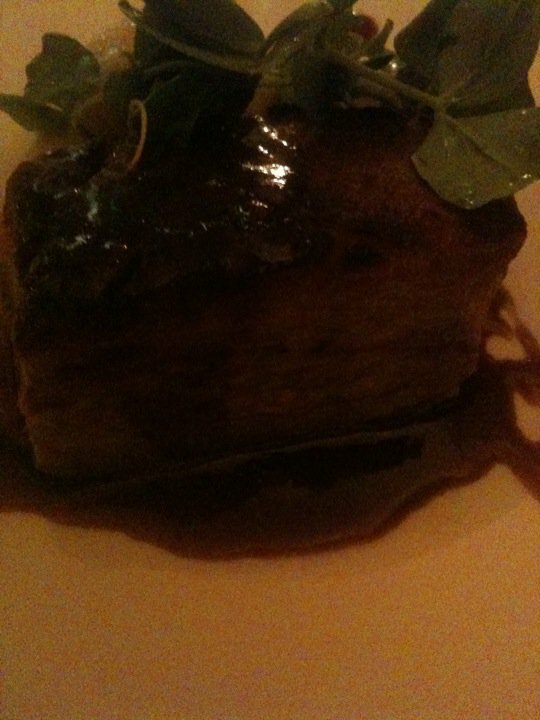 ), it came with a Yukon mash and a porter truffle sauce. Heavenly. I ended it all with the Arctic Circle. 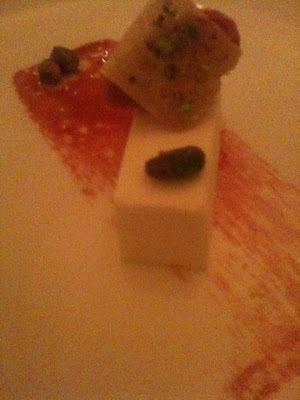 This was a parfait of goat cheese and a lingenberry sorbet. Oh and pistachios. But I don't eat those. When I posted this photo on Facebook, Jade said that it looked too pretty to eat. I ate it all. And then when I received my check, they gave me a $50 gift certificate that expires at the end of March. Since I doubt I'll be back in New York before then, I gave the certificate to Lisa B -- who suggested that I come for Restaurant Week in the first place. Yes, I would gladly return to Aquavit but I'd really like to try out Samuelsson's new place, Red Rooster. My next stop on my gut-busting outings was lunch yesterday at David Burke Townhouse. When I showed Maddie their website on Saturday, he made appreciative sounds over their decor. I made similar sounds about their food. After a brisk walk over, I knew that I could put away a little food at least. I was eagerly awaiting this lunch and decided to splurge a bit by ordering items that cost a little extra. First up? 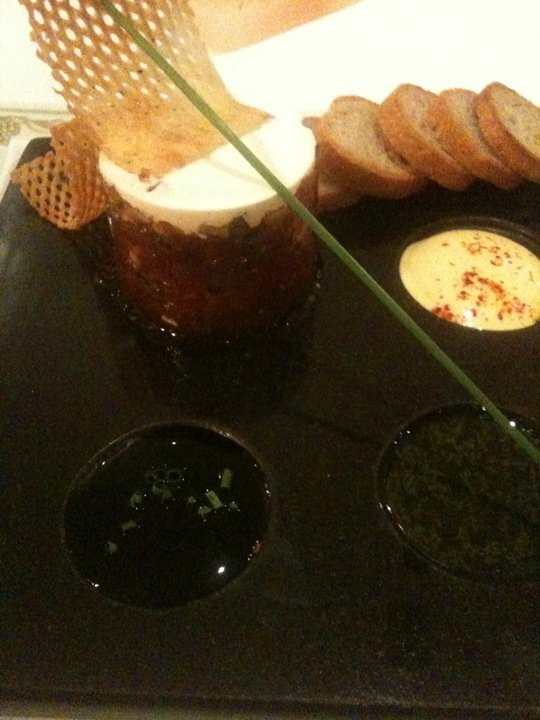 The Parfait of Sockeye Tuna and Salmon Tartares. So good I ate it all. 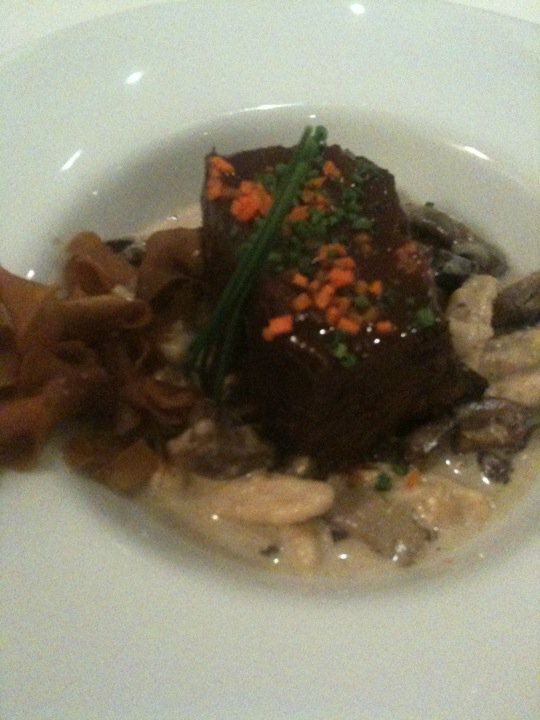 This was followed by the Braised Beef Short Rib. Heavenly! But I still had dessert coming so I had them pack half of it up. David apparently is not a fan of mushrooms but said that the rest of it was delish. 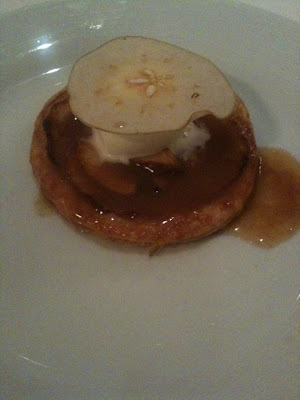 Finally the Warm & Crisp Apple Tart. The server placed it before me and then poured caramel sauce over it from a small pitcher. I could have returned to California after this meal but there was more dining to be done. I know I would gladly return to this restaurant -- as long as I don't have to sit next to the second pair that showed up. If only they could have been as charming as the ladies who were wrapping up lunch when I arrived and kept insisting that I partake of the Cheesecake Lollipop Tree they had ordered. But I needed the space in my stomach. Should have at least taken a photo for y'all though. It was just so pretty. Next trip.